Several years ago, when compact fluorescent (CFL) lightbulbs came onto the market, I was really happy. I was even happier when their prices came down and their warmth and quality improved greatly, because they really do save a lot of money, energy and natural resources. Fluorescent light bulbs break sometimes, and when they do, they release mercury vapor into the air, and must be carefully removed and disposed of like toxic waste. You just can’t put CFLs or other fluorescent bulbs in the trash—ever. Yikes! It only took breaking one of them—and having to rush my child out of a room till it could be ventilated of one of the most toxic poisons known to humanity—to ban CFLs from all but the most remote areas of my house. But even more important than the tiny amount of mercury released by one broken bulb is the huge amount of mercury used in the manufacture of all CFLs. This has far greater impact on the health of everyone, especially those who manufacture these bulbs. That’s why LED light bulbs are such Good News to people who want to save energy and money on their electric bills. have a light frequency that doesn’t contribute to headaches or other health issues. LED bulb prices will definitely give you sticker shock. 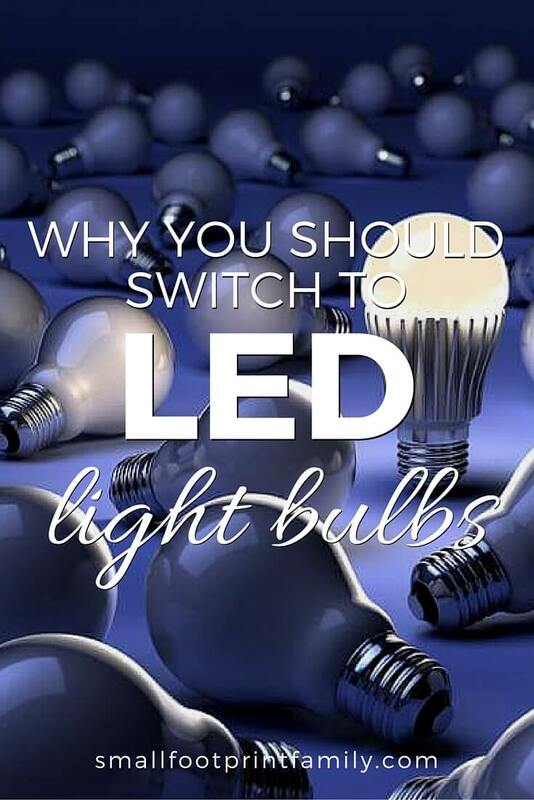 However, at a lifetime cost of $86, compared to $352 per bulb for a standard incandescent, LEDs can clearly save you thousands of dollars in your home over time. And, just like with CFLs, the price is coming down quickly, and the efficiency and quality is improving at the same time. Since they are pricey, it’s a good idea to replace your current bulbs with LEDs one at a time as they burn out, or when you can find them on sale. Amazon.com also has some really good prices for LED bulbs, too. Changing your light bulbs is a very important part of any long-term strategy to save money and reduce your family’s resource footprint. And given the ridiculous amount of fossil fuels burned every day so we can see in the dark, any improvement in lighting efficiency we make as a nation of households will also decrease our dependence on foreign oil, and protect our air, water and natural resources at home. In fact, if 63 people replaced just one regular light bulb with an LED, it would be like taking one car off the road for an entire year. If those people replaced all the bulbs in their home, it would be like removing 25 cars. Get a town of 100,000 to switch, and we’re talking nearly 40,000 cars taken off the road. Now, that’s a big difference! On a national level, if every U.S. family and workplace replaced their standard incandescent bulbs with LEDs, we’d save $3.9 billion per year, and avoid emitting over 20 million metric tons of soot, methane, mercury and carbon pollution into the air! We could really use that kind of savings right now. 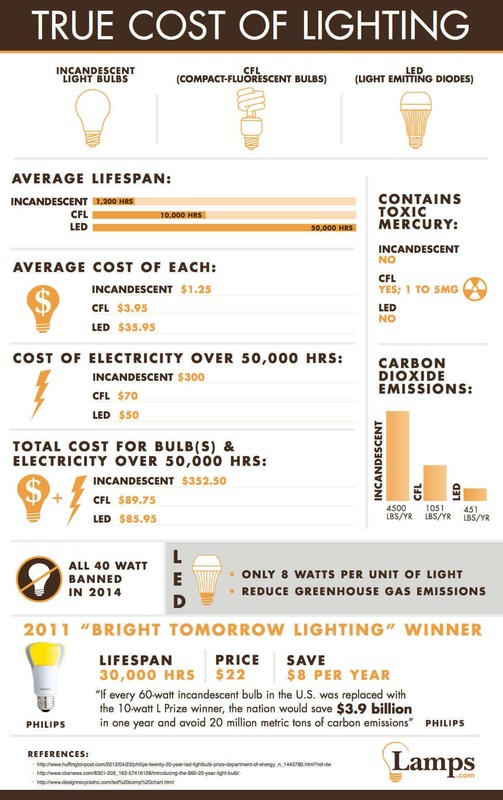 This is my latest favorite infographic, from Lamps.com, about the costs and benefits of energy efficient light bulbs. This is some really great information for anyone looking to reduce their carbon footprint. I had no idea there were so many amazing reasons to use LED bulbs. For me, specifically, not using a frequency which can cause headaches is a huge benefit, because I have struggled in the past with not being able to use CFL bulbs for very long without getting terrible headaches. Thanks so much for writing! Most interesting. There is no mention of Halogen bulbs, that look like the Incandescent but are’nt. Found them expensive and shorter life than Incandescent. In Australia, CFL’s av $6.95 and LED’s $15 – 20. (Department store prices). Mercury is not instantly toxic at such small doses. Rather it accumulates to create longer-term harm, especially if you are getting it from other sources like seafood, dental amalgams or living near a coal-fired power plant. More importantly, it is the manufacture of CFLs which is using industrial quantities of mercury that is cause for environmental concern. Great article, we have very few incandescent or CFL bulbs in our house now. I love how long the LEDs last. I know my followers could use this information so i’ll be sharing it with them. Thank you for writing this post. We are slowly replacing our bulbs in the same fashion. The CFLs gave us headaches, and I hate the disposal/toxic waste issues. In my experience with CFL’s, they do not last as long as they claim. Also, I am sensitive to them – they give me horrific headaches, so I have to use incandesent or led. The manufacturing/transportation cost of CFLs (and pollution to ship them around the world!!!) negate any savings to the earth they claim by reducing energy. I am, personally, annoyed by the phasing out of the incandsent bulbs because the only alternatives are the nasty CFL’s and the super expensive LED lights. The technology to mass produce cheaper options hasn’t fully developed yet, so the consumers are getting the short end of it. I would rather put my 40W / $1 bulb and pay a little more on my electric bill than pay for a $30 Led that won’t last as long. CFLs have been disappointing for many reasons. Incandescents won’t be entirely phased out in 2014. Just the 40W, fortunately, allowing more time for the prices on LEDs to come down. You can find LEDs on Amazon for $8 each now, which is a good sign. Wow! This is great info I never knew! Passing this one on. Thanks for linking up to Titus 2 Tuesday. hope to see you again this week! I thank you for the information you have presented but some of us have to take in consideration the cost of the bulbs themselves. Right now in this economy we are working to put food on the table and keep the lights on. I do only light with CFL bulbs and love the light they put off. I, unfortunately have to take the risk, like many others, with having to clean them up. But if I did have the money I would probably start replacing them with LEDs. I just thought I would point out that it is not always cut and dry why people use certain things in their homes. As I mentioned in my post, we will be replacing our bulbs with LEDS one at a time very slowly because of the price. Times are indeed tough! I’ve found them on Amazon for really cheap, which helps a lot. If you look carefully, and wait for sales too, they are almost competitive with CFLs now! For the amount of money they could save over time, we’re looking at our very slow replacement strategy as a longterm investment in energy saving and reducing our electricity bill. Great info, Dawn! I’ve also had a love/hate relationship with those CFLs once I found out about the mercury vapor – yikes! But I never really looked into LEDs much. Thanks for this, and that infographic is really eye-opening! Thanks for sharing at Tiny Tip Tuesday! Great post! Standard bulbs are being phased out in Europe so ninety-five percent of the bulbs in our house are energy efficient. They definitely save money, that is for sure. My only concerns are the disposal of the energy efficient bulbs, which do have toxins in them (it is illegal to dispose of them in ordinary household waste in Europe as they are dangerous if they go to landfill), and even the brightest of them are just not as bright as the lighting I grew up with, which I find disappointing. But they are an important step forward! Hi! I saw you on Frugally Sustainable. This is great info! I converted my whole house to CFLs a few years ago, but I’m very disillusioned with them because a) they don’t last anywhere near as long as the manufacturer’s claims if you use them in the normal way (i.e turning them on and off) and b) MERCURY!! Also c) I didn’t notice any drastic reduction in my electric bills. I feel ripped off! I’d love to believe the claims about LEDs, but I’m not taking anyone’s word for it this time! Do you know exactly who said the LEDs last 10 years and what kind of testing did they do? I’m currently conducting my own testing with one LED in my bathroom (got it on sale for $17 at Lowe’s). I wrote the date I installed it on the base with a marker. If it lasts more than 18 months, I’ll start buying more. That sounds fair. Since LEDs are new, no one can say with absolute certainty how long they will last, but the LEDs in my flashlights have lasted for at least 7 years, and my kid uses them a lot. I too was disappointed in CFLs, but I have much greater hopes for LEDs. Mostly, I’m grateful for no mercury vapor! We recently moved into a new house where the lighting situation was crazy – 120 watt light bulbs in every socket – including the closets! Our first electric bill was ridiculous. We have started switching out for LEDs and love them! Very clean, very warm, plenty bright. My only suggestion is to read the package and start a file – most have nice, long warranties but redeeming them varies. Some you just take back to the store to exchange, others require and receipt and proof of purchase. For what they cost, it’s worth the extra 30 seconds to snag the receipt and PoP and drop them in a file so you have them later if need be! New to me too! Thanks so much for the informative post and for linking up at Thrifty Thursday. I had a CFL bulb and it broke and shattered all over the porch. SO not fun! I am sorry to bust bubbles here but the truth about LED bulbs is that they have many toxic substances. Clean up requires gloves and a mask. They contain led and arsenic….sigh….when will we learn not to sacrifice safety in the name of economics? Notice that the name of the bulbs is only one letter short for spelling out the word leAd. This is great information, thank you! I am grateful that at least they do not release toxic vapor into the air like CFLs! It seems the main hazard with LEDs is dust upon breaking, and most types of LEDs are pretty hard to break, unlike CFLs, which are very fragile. Given that LEDs are a kabillion times more efficient than incandescents, I hope they solve this problem soon! Can you recommend what “shades” of LEDs are “warmer”? Most of the ones I’ve seen, the light has seemed so cold and brash. I made the switch to the CFLs a few years ago and have appreciated the reduction in my energy bills, however, the disposal is a pain in the behind (have to save them in a plastic bag and then remember get rid of them during the Earth Day Hazardous Household Waste Disposal events in our community). I wouldn’t mind making a switch to more energy efficient bulbs and getting completely rid of the toxic waste aspect. The type and shade of the light is measured in a temperature rating known as Kelvin (K). The higher the K temperature, the brighter the shade of white light produced. A warm, white light is 2500-3000K. Look for that. The Philips bulb with the yellow cover (like the one in the infographic) is very warm, and the technology keeps getting better and better. We have been using LED bulbs for about 2 years now. We live totally off the grid and LED bulbs hardly pull anything from our solar power 🙂 I highly recommend them to anyone. Oh and if the bulb itself breaks the light still works because the LED’s are flat in the base. Just make sure your get all the shards of glass off of it first. That’s great to know! Thanks for sharing! I’m sorry but I just don’t see how a propaganda site fighting against the ban of 40-watt incandescent bulbs in 2014 is relevant to whether or not families decide to reduce their electricity costs using LED bulbs. While the site is pretty well researched, I still see no reason why we need to keep a fossil like the 40-watt standard bulb around. It should go the way of the rotary phone and leaded gas—both of which had their staunch supporters fighting to keep them around too. Feh, good riddance. In 2007, Australia became the first country to “ban the bulb,” drastically reducing domestic usage of incandescent light bulbs. By late 2010, incandescent bulbs had been totally phased out, and, according to the country’s environment minister, this simple move has made a big difference, cutting an estimated 4 million tons of greenhouse gas emissions by 2012. 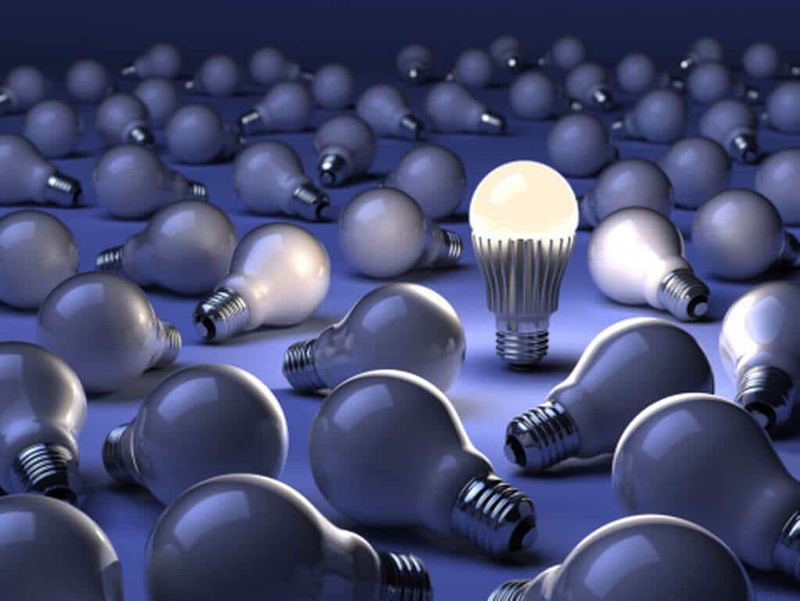 China also recently pledged to replace the 1 billion incandescent bulbs used in its government offices with more energy efficient models within five years. As the U.S. continues to fall behind every single other developed nation (including China) in everything from lifespan to literacy rates, why on earth we would intentionally shoot ourselves in the foot by hanging onto inefficient technologies and outmoded ways of thinking? The one thing I will say is that it is indeed true that our light bulbs are NOT the reason why our coal plants are spewing mercury and other poisons into our air and water. But just because we need to address the source of our energy and the way we generate it, doesn’t mean we also don’t need to reduce our energy usage and be more efficient at home and work. Telling people we need to keep using inefficient 40-watt incandescent bulbs because the real problem is dirty coal plants would be like telling people not to insulate their homes or weatherstrip their windows just because the “real problem” is that they live in a cold climate. That just silly. We need to do both: address both the sustainability and renewability of our energy sources, and reduce our power usage at home and work. And my own personal experience (and that of other users in the comments) shows first hand that we are indeed saving lots of money with energy efficient bulbs. It’s not hypothetical, it’s not light bulb industry propaganda; it’s real, significant savings on my very own electric bill. And if you live off the grid and produce your own power, as many SFF readers aspire to, it would simply be foolhardy to use incandescent bulbs, unless you had no other choice. Finally, the price for LEDs has already come down substantially in just the last 3 years. These bulbs were once $50-$60 each and they didn’t light very well. Now they can be as low as $15 each on Amazon.com and come in nice, warm shades. There is no reason to think we won’t continue to make improvements and price reductions in lighting technology as time goes on. But the 40-watt incandescent: Dinosaur. Let it go.